The Horizon Manual Resuscitator allows you to deliver a high standard of patient care while effectively managing healthcare costs. Horizon Manual Resuscitators come standard with a bacterial/viral filter, oxygen reservoir and mask. 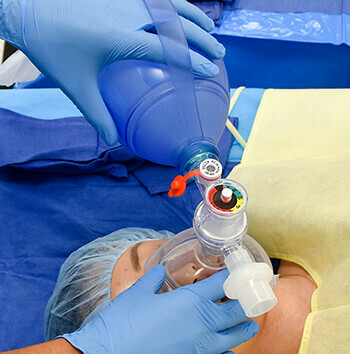 Optional safety components and comfort features allow you create a custom resuscitator to meet the needs of each patient and of your facility’s budget. Single patient use resuscitation/ventilation bag available in a variety of volumes. Available with or without integrated pressure manometer. Integrated color-coded pressure manometer effectively promotes proper pressure delivery (<20cmH2O); the tri-color fields alert to the risk level of delivered pressure. Accurate pressure delivery helps reduce gastric insufflation, thus preventing vomiting, aspiration and resulting pneumonia. Face mask proportionately sized to resuscitation bag size. Select from a variety of components to assemble a custom resuscitation bag (see Brochure).